The new book that I co-edited was — rather fittingly, given that it’s world book day — published by Irish Academic Press today. Co-edited with Mel Farrell (Maynooth University) and Jason Knirck (Central Washington University), it brings together established and upcoming scholars to explore Ireland in the 1920s. In the aftermath of the Great War, Europe’s empires crumbled and a patchwork of new nation states emerged across the continent. As the map of Europe was being redrawn after 1918, Ireland too stood on the threshold of great change. The 1920s were a formative decade for Ireland politically and economically, both north and south of the border, but the decade is all too often dismissed as one of stagnation. 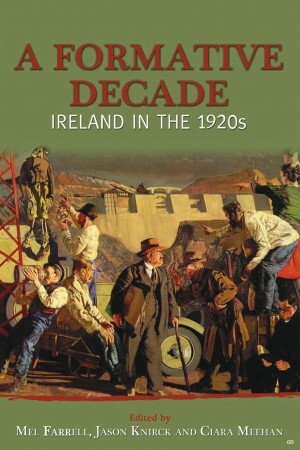 In contrast, the contributors to this timely collection provide a refreshingly alternative view of such events as the Shannon hydro-electric scheme, and the workings of the Church of Ireland and of the Senate – all serving to reignite the debate about how modern Ireland was fashioned and how statehood collided with national identities and allegiances. The relationship between policy and the emerging state is also explored in chapters focusing on Free State election posters, loyalty and treason, the 1923 Land Act, the Irish Farmers’ Party and parliamentary democracy. Other dynamic contributions look at how economic policy shaped the lives of ordinary Irish citizens and continues to have an impact today, long after Ireland won its struggle for independence. Purchase for €22.45 (PB) or €49.95 (HB) from Irish Academic Press. Cumann na nGaedheal: A New ‘National Party’? Next Next post: A Fine Gael – Fianna Fáil Coalition?